The CPI without food and energy rose 2.24% from a year ago, after having already risen 2.14% in April. 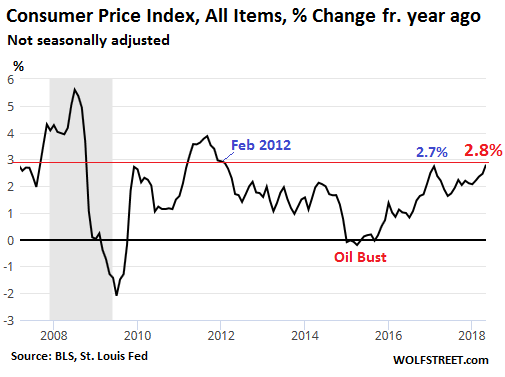 These year-over-year percentage changes in the Consumer Price Index are slower than what consumers experience in terms of actual price increases. 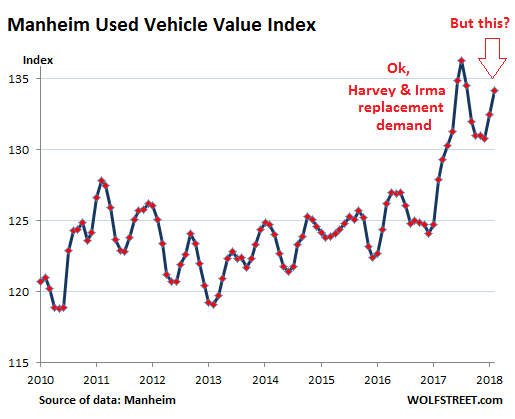 Here are two big examples of how this discrepancy is happening: prices of used vehicles and new vehicles. In reality, used cars and trucks cost a lot more today than they did in 1994. The big differences between reality and CPI are numerous adjustments, including most prominently “Hedonic Quality Adjustments.” When a model has quality improvements from one year to the next, the price index for that model is adjusted for the costs of these improvements, based on data provided by the automakers. Quality improvements in vehicles include: Reliability, durability, safety, fuel economy, maneuverability, speed, acceleration, deceleration, carrying capacity, and comfort or convenience. Additional adjustments are made for added or deleted equipment. This makes sense on some theoretical level, as vehicles have gotten a lot better over the decades. While consumers pay a lot more, they also get a lot more. That’s the theory behind extracting the costs of quality improvements from inflation data. These adjustments lower CPI data compared to actual price changes that car buyers experience in reality. In reality, a five-year old compact car today costs a lot more than a five-year old compact car cost in 1994, and shoppers who want a five-year old car have to cough up the new prices and cannot buy anything with the amounts they were able to buy a five-year old compact in 1994. 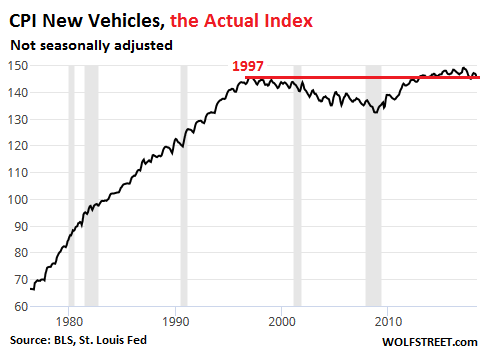 In the new vehicle department, a similar trend emerges: In reality, new vehicle prices have surged. In May, the average retail “transaction price” – after all incentives and discounts – per J.D. Power estimates, rose by about $1,200 from a year ago, to $32,380. That’s an increase of 3.8%. 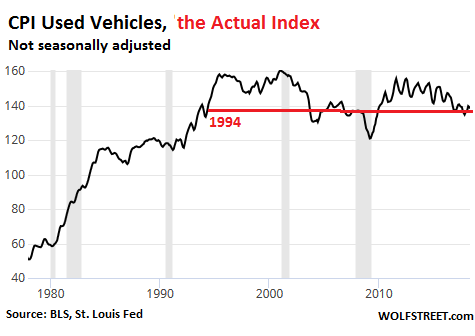 Note the mystery: Both used vehicle and new vehicle CPI surged until the mid-1990s, though vehicle quality improved over those decades as well. 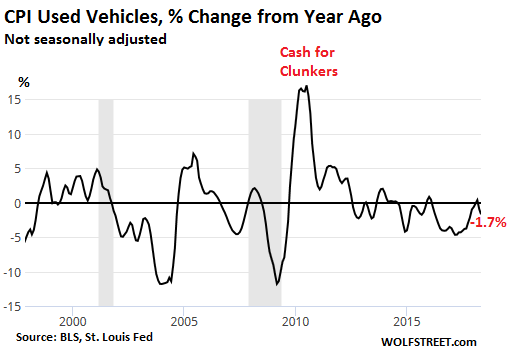 Then, suddenly, new- and used-vehicle CPI began to flat-line. I believe this distortion has largely to do with how the hedonic adjustments have been tweaked since the mid-1990s to repress overall and “core” CPI. Used and new vehicles matter in the overall CPI, with a combined “relative importance” of 7.1% of the total index. And these hedonic adjustments are applied to other products as well, such as TVs, cell phones, and myriad other things. But there are at least two problems with these hedonic adjustments: One, if they’re even slightly aggressive, their impact is cumulative and ends up producing systematically understated inflation, which seems to be case in the new and used vehicle data; and two, over the years, consumers have to deal with a life in reality that gets more and more expensive as the items that perform the same function, such as a five-year old compact car, simply cost a lot more than they used to. If consumers often feel in their pocket books that the official CPI data is a hoax, these hedonic adjustments — however logical they may appear in theory — are a reason why they feel that way. The world needs more dis-intermediation, i.e. less middle men. Hedonic adjustments are just a way for a pointy head to obfuscate the truth. Just public the raw data and let us make up our minds. But we know why TPTB don’t allow that, don’t we? I would just like to have the option to purchase a relatively new car that has a chrome bumper…. Reliability, durability, safety, fuel economy, maneuverability, speed, acceleration, deceleration, carrying capacity, and comfort or convenience. I see most of these apply to the general trend in the outsizing of US cars; 400HP muscle cars, really big SUVs, and the 50K PU limo. The automakers have always tried to sell you more than you need, and yet somehow that doesn’t work into inflation? more speed, more acceleration, more carrying capacity, its all MORE. how does that square with hedonics? Auto dealers have always played this game. Here’s one for Wolf. A close friend in HS, his mother bought a 68 Mustang. Dealer upsold her to the one with a 390. Boy were we glad he did. Oh yea, it was a V8!!! In 1957 you could buy a brand new Jaguar XK120, off the showroom floor for $3500. Today you would pay $200,000 for a used version in decent condition (but nowhere near as nice as brand new). If cars are so much better now why are the old ones in such great demand and why has the sticker price (of a used one) inflated 57X. And, how about a negative hedonic adjustment to subtract off value for being bland. Older vehicles were fun to drive. New vehicles are too boring to tolerate anymore – just a bunch of oversized, boring, look-alike trucks and SUV’s (fat station wagons or station wagons for fat people). And yes, of course governments and central banks use inflation as an invisible stealth tax because the populous will not tolerate a visible tax yet votes for increased government spending. You can avoid the tax by avoiding dollars. Own dollars at your peril. The CPI has been distorted by a myriad of “adjustments” over the years, so as to be beyond use as a viable tool of economic measurement. The truth lies somewhere between today’s highly “massaged” numbers and John Williams Shadow Stats measurement model. The CPI has become nothing more than a governmental lever in their effort at capping indexed programs such as Social Security payments, and to paint a “rosy” economic scenario for the gullible. The CPI also doesn’t ever consider the cost of subtitute items. They might have picked a tube of Crest toothpaste long ago but they don’t consider any other kind would be picked by the average consumer. Obviously flawed when price is such a major factor in consumer behavior. Bahahaha, the used car price increase is real enough. Case in point: I’m no dummy (live off grid, own home, have well, grow food, blah, blah blah). Searched Craigslist 5 mos. (and found) under 80,00 miles all wheel drive (AWD) for $5,000. The used vehicle ads made my head spin. This is a typ AWD ad: low miles (150,000), RARE paint color (as if I cared), paid $35,000, yours for ONLY $25,000! Are people that stupid? I think some are. I have talked to enough of these inflated sellers to have an idea of what drives the insane logic. The term I hear for cars, off road vehicles and even houses is: “If someone will pay that price, then it is worth that price.” They don’t look into book values, they don’t look at market comparisons. They look at the item they want to buy(say $100 item) with the money from the sale, then subtract what money they have in the bank(not much these days – $20 for this example) and then use that number($80) as the price they want from their old beat up item which is only worth $40. They don’t have the funds to make up the gap, so try and sucker someone. Too expensive to buy and actually own a car? No worries, there is the subscription option, aka leasing. What? Leasing is still too expensive? Well then, soon coming to a dealer near you: subscription and SHARING the cars with strangers. See news about Toyota investing in Grab. Hedonistic adjustments with mixed in arbitrary 2% inflation target and the Fed had the perfect excuse for QE. Wolf, if this needed to reverse, all the Fed needs to do is start questioning their algorithms and measuring methods. Much easier to achieve since it pairs with reality. Is it just me, or are the talking heads more hawkish on inflation lately? A few exerts from that video I linked. Are these guys economists or comedians? Wolf, huge fan of your site, and sorry for linking outside material. 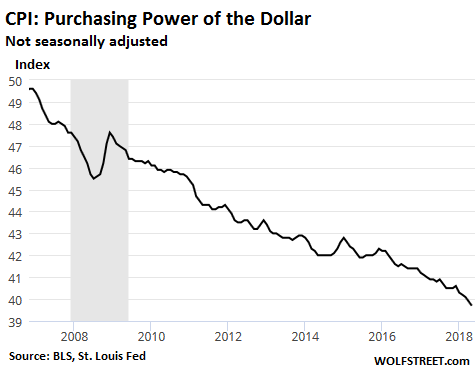 Today’s dollar isn’t as strong as it used to be but that’s because the Fed and our leaders wanted the benefit of foreign investing/purchasing dollars flowing into America. Any wage increase for American workers is quickly lost to hidden and real inflation. We have all noticed the creative ways food packaging has been used to mask the quantity of food inside it. A tub of ice cream used to be sold in 64 ounce containers and now the standard is 48 ounces. Any wage increase for American workers is quickly lost to hidden and real inflation. Answer: No one forced you to borrow. Just be glad they’re hiking rates. Lets hope it doesn’t stop. Uh, yeah we are forced to borrow. You can’t do a damn thing without money. Wage destruction, job destruction, and wealth hoarding by the undeserving rich have forced people for generations to borrow money just to have a basic lifestyle. “Fiscally conservative” is a smear put out by people who have plenty of cash and think they are better than everyone else. No one forced anyone to borrow. They “nudge” you to do it. If your friends, relatives borrowed harder than you and own bigger houses, better cars, more attractive spouses, more vacations, you start to think these are “basic lifestyle”. If you stay “conservative”, you will find that you will get rent squeezed. House rent, tuition, medical insurance, just keeps rising and you see those who have borrowed to buy houses can now offload to the next sucker who is willing to borrow more. Everybody is getting rich by borrowing and the “conservative” gets rent squeezed. The big advantage of “conservative” or debt free is that they are NOT fear of stop working, of dropping asset prices, of saying “F U to their boss” if they don’t like their boss. So freedom Vs material. Usually “basic life style material” wins and nudges you into debt. But now the poor old always bashed FED has a whole new worry. If he does impose 25 % tariffs on cars and / or parts on NAFTA countries, all US outfits are in varying degrees of trouble. That’s what the US auto industry has said. Unlike the steel industry where there is a wafer- thin component that will benefit ( one fortieth of the steel biz) there is zero support from the US auto sector. As WS has pointed out, autos have enough problems, and a slow down is looming. For trucks and Jeep types, the insane scramble over rocks and crashing through brush could be taken as: don’t do this with a new truck. Maybe the more campfires ad was for the Mini. It was for that or the Fiat 500, either of which would be crowded for a family camp. I always thought it would be interesting to look at inflation rates in countries which either use the dollar (Panama, Ecuador, El Salvador) or whose currency is pegged to the dollar (Saudi Arabia, Bahamas). In theory their inflation rates should be the same as the US (ie no one talks about different inflation in California and New York). The BLS releases inflation data by region and metropolitan statistical area (MSA). You see these crop up more often in local discussions, such as where rent-controlled rent increases are pegged to local inflation. Inflation rates vary with locality (inflation in San Francisco v. inflation in Panama), just like they vary with the product (inflation in used vehicles v. in sandwiches). Sorry, but I have no idea what ‘CPI rising prices’ actually means any more. I accept college tuition is rising because kids and their parents are a captive market and total suckers … they’re buying a name and an experience rather than an education. Schools ream them because of that. Cattle are smarter … they would run in the other direction if they could. College kids today embrace and cherish being screwed over. Note to the kids … enjoy the debt and I will never willingly absolve you of it. Beyond that, I don’t necessarily buy the rising CPI. I know how to shop. Perhaps those who can’t be bothered to learn how to shop or why they should are subsidizing me. I think you are analyzing people who happily pay retail and more for a good reason, to them, and comparing it to ordinary people and people like me who know how to drive a bargain … and live well and for less always. I can tell you what it means. It is used to establish COLAs in many, many contracts and applications. The TOTAL of the SIX most recent annual Social Security COLA’s is 5.8%! Please note carefully, that it the TOTAL, not the mean, average, etc. It is the TOTAL for 6 years. The cumulative effect over decades of COLAs being even a few percent below “real inflation” is devastating. A 3% differential will cut actual purchasing power in half in a little over 20 years. That is the REAL plan for saving the SS system! My mother got a 14% COLA in her SS, about 1984 – 1985. I wish my Fed-debased dollars had only lost 2.9% of their purchasing power. In the real world, at least the one I frequent, inflation is biting much harder. I remember from college economics, utility was another way of justifying buying something that didn’t make economic sense otherwise. As in, l can’t afford this car. It will stretch my budget for the next 84 months, but it has utility to me. Your concept of utility is not the same as anyone else’s. Utility = usefulness. My concept of usefulness is unique to me. In principle, going to school with $1million in loans has utility for some people. These people run the Fed. “Inflation” is actually just as personal as utility. What a person sees as inflation depends entirely on what they do with their money. For example, people who want to buy a house, and buy income producing equities to supplement their Social Security in retirement have see very high inflation of late. More of their income on basics. You can bet the wages gains went to the top and not to the lower classes there by widening the wealth gap even more. CPI is just so much BS and has been for years. Inflation also varies by income class. For low wage earners when rent takes up to 50% of your income and it rises by 10-20% a year, that’s more than 2.5% inflation. The middle class and above don’t see this as they usually own their own homes and so are immune to rent inflation. “CPI is just so much BS and has been for years”. The Bureau of Labor Statistics is responsible for the Consumers Price Index report. The problem is, that the credibility of the report is only as good as the credibility of the organisation that prepares the report. Do you really believe that the BLS unemployment rate is less than 4%? Enough said about their “credible” reports! If you don’t know the definitions of the data going into these calculations, you will misunderstand the results. That’s a huge problem with all these economic tidbits the media are throwing around, such as “4% unemployment.” People have no clue what this means. They just invent their own definitions, and then their interpretations of the results are truly grotesque. That’s why I spend so much time explaining the definitions (particularly “unemployment” data). So please read my unemployment articles and my comments on them carefully. This is why I explained “hedonic quality adjustments” in this article. It’s an important and valid concept, but it’s used very aggressively. So check it out. Here in Canada the CPI does not include gas, groceries or rent. All the stuff you need to live. As bad as US inflation numbers may appear to be, my guess is that they have been worse in many other industrial countries since the days of the old gold standard. The British pound has gone from 1 pound = $4.80 US to 1 pound = $1.40. In 1913, the Italian lira was worth 25 US cents. By the 1990’s, the 1 lira coin was virtually worthless. 50 cents will still get you a stamp to mail a domestic letter in the US. In Canada, one would pay at least C85 cents plus tax. And yet due to many currencies losing value against the dollar, Americans can enjoy vacations at certain foreign countries without wasting that much money. Exactly, it’s possible to LIVE the high life on the back of the strong USD…..just not i the USA. Exchange rate trends are not the primary issue there. The minimum wage PER HOUR in America is TWICE the global median working wage PER DAY. This came about because of unique circumstances at the conclusion of WWII, not because American workers are so much better. As we drift back towards a more “normal” scenario, Americans with no special skills or education, and no capital to invest, will have some very unpleasant adjusting to do. What is the composition of vehicle purchases? It seems like people are again migrating towards expensive trucks and SUVs. This doesn’t surprise me. Looking at various car models from 2007 vs. 2018, and typically the price seems to have increased around an average of 1.5% a year. There’s definitely validity to the argument that I can’t buy a 2018 model that just contains the features of the 2007 model, but on the other hand, there’s no denying that a brand new 2018 model with the new features it has vs. a brand new 2007 model without any new features should be more expensive. I don’t think either side of the argument is wrong, per se.